Product Claims: "Our African Black Soap sulfate-free shampoo helps regulate sebum production, while alleviating itching and flaking. Our special blend of soothing Plantain Enzymes, clarifying Tea Tree Oil and Willow Bark Extract removes product buildup and strengthens hair by sealing in natural moisture. Helps calm scalp irritations for healthy hair with a brilliant shine. Directions: Apply to wet hair, lather and massage at the root to stimulate the scalp. Rinse thoroughly. Repeat if necessary. Ingredients: Deionized Water, Decyl Glucoside (Sugar Beets), African Black Soap, Salicylic Acid, Salix Alba (Willow)Bark Extract, Melia Azadirachta (Neem) Seed Oil, Charcoal Powder, Melaleuca Alternifolia (Tea Tree) Leaf Oil, Simmondsia chinensis seed (Jojoba) Oil, Butyrospermum Parkii (Shea) Oil*, Aloe Vera Leaf Juice, Vitamin E, Rosemary Extract, Plantain Extract, Lonicera Caprifolium (Honeysuckle) Flower (and) Lonicera Japonica (Japanese Honeysuckle) Flower Extract. My Experience: I really like this shampoo. It's my clarifying shampoo so I don't use it every single wash day, but I do use it pretty often. It gets my hair very clean, yet it doesn't make it feel stripped at all. I've never experienced a dried out feeling from using it. It lathers pretty well unless my hair is really dirty or loaded with product buildup. If that's the case, it takes the second round for a good lather. This is usually the case with any sulfate-free shampoo when my hair's pretty dirty though. I don't mind it either because it makes me aware of how dirty my hair actually was and ensures I do a second wash. The consistency is more runny than usual for a shampoo. I can't say this is something I've paid attention to in the past, I only noticed because when you pour it in your hand it tries to escape like any liquid would! Lol I'm not sure if that will be important to anyone. The scent is very light and doesn't linger. I don't know how exactly to describe it, but it's kind of sweet smelling. Probably due to the plantains. I like it. This shampoo is made for dry, itchy scalps and that is the main reason I decided to try it. I used to have some issues with my scalp being exactly that: dry and itchy with occasional dandruff. The key words in that sentence are used to. 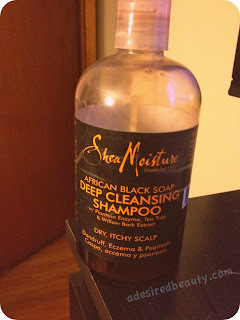 I believe the combination of using this shampoo and my beloved ACV rinses have helped my scalp tremendously. That is also the reason I use the shampoo more often than I need to clarify my hair. 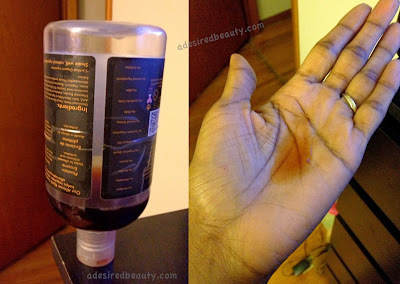 When my scalp feels "irritated or itchy" I use it, and sometimes I use it just because I haven't in a little while and want to use it regularly. I think that about sums it up. This bottle is just about gone and has lasted a long time. I will be repurchasing it. It is my other staple shampoo. Moral of the story: I would definitely recommend this shampoo to others. 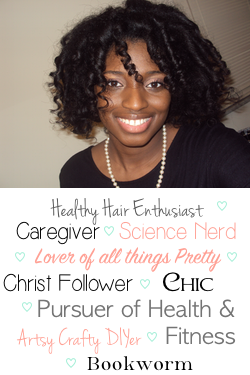 Especially if you want a sulfate-free clarifying shampoo, have scalp issues, and/or love all natural products. It's a keeper in my book! Has anyone else tried this shampoo? Like it, love it, never want to use it again?? Awesome review. I use shampoo so infrequently that my list of poos to try just gets longer and longer. Ha-ha! I've had my eye on Shea Moisture products for a while now, Nice review! Thank you! You should totally try them. I really like almost all of the ones I have tried.